From Kathryn Harrison, one of America’s most admired literary voices, comes a gorgeously written, enthralling novel set in the final days of Russia’s Romanov Empire. St. Petersburg, 1917. After Rasputin’s body is pulled from the icy waters of the Neva River, his eighteen-year-old daughter, Masha, is sent to live at the imperial palace with Tsar Nikolay and his family—including the headstrong Prince Alyosha. Desperately hoping that Masha has inherited Rasputin’s miraculous healing powers, Tsarina Alexandra asks her to tend to Aloysha, who suffers from hemophilia, a blood disease that keeps the boy confined to his sickbed, lest a simple scrape or bump prove fatal. Two months after Masha arrives at the palace, the tsar is forced to abdicate, and Bolsheviks place the royal family under house arrest. As Russia descends into civil war, Masha and Alyosha grieve the loss of their former lives, finding solace in each other’s company. To escape the confinement of the palace, they tell stories—some embellished and some entirely imagined—about Nikolay and Alexandra’s courtship, Rasputin’s many exploits, and the wild and wonderful country on the brink of an irrevocable transformation. In the worlds of their imagination, the weak become strong, legend becomes fact, and a future that will never come to pass feels close at hand. Mesmerizing, haunting, and told in Kathryn Harrison’s signature crystalline prose, Enchantments is a love story about two people who come together as everything around them is falling apart. Grigori Rasputin: faith healer, mad monk, priapic charlatan, resilient victim of assassination . . . and family man? Kathryn Harrison tackles all his identities in her new novel, “Enchantments.” This splendid and surprising book circles through time and around stories both real and imagined, lending a tender perspective to familiar historical events as experienced by two central characters — Rasputin’s daughter Maria, known as Masha, and Alyosha, the hemophiliac Romanov heir — whose physical and emotional suffering acutely remind us of the human lives behind the legends. In St. Petersburg, in a court already fascinated with the supernatural, Rasputin became a fashionable novelty. He seems to have treated his patients by employing a sort of hypnosis, breaking the cycle of pain by persuading the rest of the body to stop tensing against it, a technique used by modern pain therapists. The czarina, desperate to save her son, decided that Rasputin alone could cure young Alyosha’s bouts of agonized bleeding — and save the throne for the Romanovs. The Romanovs, a doomed family well represented by the glittering excess of that Fabergé egg, are contrasted with the often unsavory singularity of Masha’s father. Alyosha, convinced he will be the last among these prisoners to die, is largely singular too: alone in his room, denied morphine lest he become addicted to it, and unable to share many of the simplest pleasures that comfort his sisters. He relies on Masha and her stories to provide a window to the wider world. Harrison presents Masha’s often admittedly fantastic narration in an admirably refined style, using the labyrinthine structure of her own storytelling to mirror this young woman’s approach to the truth. Masha’s imagination guides her from descriptions of historical events into depictions of the inner lives of the two tragic figures, her father and Alyosha, who are closest to her. She also invents a love story for the czar and czarina. In Masha’s telling, Nicholas is instantly enthralled by Alexandra and begs her to marry him, despite one great flaw: she walks beneath a visible cloud that is never entirely dissipated, a symbol of the hemophilia her only son has inherited from her, which has condemned him to a life of misery. In order to secure the future of the empire, Alyosha must discipline himself to try to appear healthy. But Masha tells of an afternoon when his stoic facade breaks down. Indulging in one of the family’s favorite pastimes, riding a tea tray like a sled down a stairwell, he strikes his knee on the newel post and begins to bleed internally. The house is filled with his anguished screams. Yet Masha comes to wonder whether Alyosha might have deliberately injured himself in order to distract his family from their own troubles. Robust Rasputin is the opposite of the fragile Alyosha. His assassins invite him to dinner and feed him cyanide, which fails to have the desired effect. They shoot him, and still he lives. They crush his skull and throw him in the Neva, where he finally drowns. All this we know from the history books. Harrison makes it intimately memorable by presenting the aftermath, the grisly yet loving scene of Masha and the family servant (who is also Rasputin’s paramour) washing his body and preparing it for burial — the simple actions of moving his frozen limbs, tending to his ragged fingernails, washing the blood from his hair and sewing up his head wound. Like most writers who choose historical figures as their subjects, Harrison has necessarily left out some details. Readers of “Enchantments” will not learn much of Masha’s later life in Paris with an abusive husband, or be told that she had two children. When Rasputin’s chief assassin wrote a book about the murder, she sued him, but without success. She found work as a circus performer and wrote memoirs of her own. She was employed in a shipyard, became an American citizen and married again — to a man named Gregory. The most enduring legend about the demise of imperial Russia is, of course, the belief that the youngest Romanov daughter, Anastasia, survived the massacre of her family. The most famous claimant turned up in the 1920s when some of the Fabergé eggs were being sold in the West. Recent forensic testing has determined that the real Anastasia’s bones were in fact buried with those of her family. But while the dream of Romanov survival may be dead, Kathryn Harrison has given us something enduring — the last romantic figure of the era, a whip-cracking circus girl who was once an intimate part of a dying empire. Perhaps best known for her provocative memoirs, Kathryn Harrison triumphantly returns to her historical fiction roots with Enchantments, the sweeping (and wholly imagined) story of love between two unlikely allies: Maria Rasputin, daughter of “Mad Monk” Grigori Rasputin, and Tsarevich Alexei Romanov, would-be heir to the Russian empire. As with her previous novels Poison and The Binding Chair, Harrison takes a particular moment in time and brings it to stunning life. It is 1917 in St. Petersburg when a diver pulls Grigori Rasputin’s battered body from the Neva River. That much is historical fact, but afterwards Harrison’s story becomes an alternate history: In the wake of their father’s brutal death, Maria—Masha—Rasputin and her sister, Varya, are sent to live with the Romanovs in the royal palace. Before his murder, Rasputin served as a healer to Alexei—here called Alyosha—Romanov, and the Tsar and Tsarina feel compelled to care for his children after his passing. Tsarina Alexandra has other motives, too: Alyosha suffers from hemophilia, and she hopes Masha might care for her son as Grigori did. But when the Bolsheviks place the royal family under house arrest not two months after the Rasputin sisters arrive, something entirely different happens. Masha and Alyosha become friends and confidants, distracting each other from the world outside and Alyosha’s condition with stories of their families’ histories, their hopes for the future and the creation of a rich fantasy world only the two of them share. Masha and Alyosha begin to fall in love, but before that love can be fully explored, they are separated—first by distance, then by death. Harrison is strongest when she writes about Masha—not just as Rasputin’s daughter, but as a living, breathing, feeling young woman in an impossible situation. The relationship between Masha and Alyosha is complicated, confusing and often all-consuming, as most young loves are. Much has been written about Rasputin and the Romanovs, but Harrison brings her unique narrative perspective to Enchantments, re-imagining history—and a love story—in a completely new way. The father in question is Grigori Yefimovich Rasputin, the feared and despised influence behind the czar’s throne, and the speaker is Rasputin’s 18-year-old daughter, Masha. The Mad Monk had children — who knew? Harrison’s discovery of this historical information, she notes in her acknowledgments, inspired her narrative. Masha is soon recruited by the czarina, in the hope that she has inherited her father’s powers of healing and will be able to help the young czarevich, Alexei, with his precarious health. Masha comes to know Alexei more intimately as Alyosha. He suffers from hemophilia, the blood disease that has turned out to be another part of his royal birthright. Masha’s mention of the year, 1917, tips us off, however, that she will not be able to save Alyosha and that the Romanovs will soon fall.The young czarevich will indeed bleed to death, though not because of hemophilia. The territory of “Enchantments” is familiar therefore, but the perspective is new. Masha’s redemptive gifts turn out to be those not of the healer but of the storyteller. In the months after the czar’s abdication, when the Romanovs and their entourage are incarcerated, she and Alyosha weave a magic carpet of story — stories they trade, embroider, re-invent; stories about horses, America, the devil and especially their own families. Masha re-invents our ideas of Rasputin, and the world of Nicholas and Alexandra is imbued with a glow whose fierceness is governed by the imminence of its loss. Harrison has written previous historical novels, notably “Poison,” but her most famous book, and in a way her ur-text, is “The Kiss,” a devastating memoir in which she tells of the sexual abuse inflicted on her by her own father. “The Kiss” burns with submerged fury, and it announces themes that weave through her work like intertwined veins. In her books, we find a wounded yet steely and profound understanding of power and the hope, the dream almost, that through the wonder of words history might be understood and reclaimed. Another wonderful moment occurs when the deposed czar tries to take a ride on his bicycle and discovers that even such an innocent desire has been rendered dangerous and absurd by the new forces in control. The novel’s guiding metaphor is the collection of jeweled eggs that Fabergé crafted for the czar’s children, and one of those eggs in particular, a replica in miniature of the grand imperial palace. Those jewels help fund Masha’s escape from Russia to Europe and America, where she becomes a circus entertainer. The bigger lion that she tames is history itself, a beast that devours the Romanovs without compunction. “Enchantments” climaxes, as the reader senses it must, with the grisly extermination of Alyosha and his family and the annihilation of their corpses, stacked “like logs on the back of a truck” — dismembered, thrown down a mine shaft, burned and covered with acid. Harrison’s narrative tactics deliver this oft-told moment with shocking freshness, and a major part of the job of any historical fiction is fulfilled. Harrison acknowledges Bulgakov’s “The Master and Margarita” as an influence; I think I also detect shades of Angela Carter. Harrison is ruthless in her exposure of emotion’s darker side. The Romanov world isn’t idealized, exactly, but the way that world is crushed reminds us of a crucial truth: The individual counts, always and forever. Author Kathryn Harrison is best known for her 1997 memoir, The Kiss, an eerie book, somehow both passionate and dispassionate, about a shocking subject: her love affair with her own father. To turn to historical fiction after such impossible self-exposure, as she has now done several times, might seem like a retreat, but Harrison’s new novel, Enchantments, a Romanov fantasia, bears the same fidelity to difficult emotions that The Kiss did. The result is a strange and slow-burning tale, hard to forget. The narrator of Enchantments is Masha, daughter of the healer and monk Rasputin. As the book begins, her father has been murdered, and she becomes a ward of Russia’s final tsar and, in particular, a companion to his heir, Alyosha. Hemophilia, in 1917 a catastrophically dangerous disease, has forced this son to bed rest, and to entertain him, Masha begins to tell stories, some real, some fantastical. This is a static premise, and there is not much momentum in the early stages of the book. But soon Masha begins to recount the lives of Rasputin, the Tsarina and other characters, and these looping chronologies become immersive — and indeed come to seem like their own subtle commentary on historical fiction. Even better, they draw effortlessly (and therefore, probably, with a great deal of effort from the author) on the demi-Christian jumble of omens and demons to which many Russians of the 1910s subscribed. Though Masha and Alyosha are compelling, the book’s greatest strength is actually its secondary characters. We know the unhappy fate of the Romanovs — revolutionaries annex the palace essentially as Masha arrives — and await it with some dread. In particular, the tsar, Nikolay, is a moving figure: martial, dutiful, unimaginative and here — humiliated by his former servants, his actions mechanical, only manners keeping him afloat — he comes to seem more tragic even than his famous daughters. Enchantments is flawed. Its writing is heavy, gleaming and self-serious, like a luxury good, and lacks the spring and verve from which historical fiction, already prone to dustiness, can especially benefit. And it is a book with alienating aristocratic sympathies, the peasants either loyal Borzoi or heartless turncoats. But Harrison has taken a tired subject, the Romanovs, and offered a fresh vision of it. Perhaps because in their backward groping historical fiction and memoir are closer, to her, than they might seem to us: After all, Masha is a young woman in thrall to a magically charismatic father, who sketches her relationship with him in a series of stories. Doesn’t this sound like The Kiss? Masha Rasputin and her younger sister, Varya, became the wards of deposed Tsar Nickolay Romanov in 1917 shortly after her father’s mutilated body is pulled from the river. The daughter of Grigory Yefimovich Rasputin, known better as the Mad Monk Rasputin, she understands that the only safe place for them is with the tsar and his family, even though she would rather leave St. Petersburg to be with her mother back in Siberia. Masha and Varya leave for the imperial palace and soon find themselves under arrest with the royal family. Hoping that Masha has inherited some of her father’s mythical healing powers, Tsarina Alexandra asks Masha to attend to her son Alyosha, the tsarevich and next in line to carry on the Romanov dynasty. Sick since birth — his hemophilia is unspoken of and he is never seen in public unless healthy — Alyosha suffers from extreme loneliness and is burdened with the knowledge that he will die earlier than expected. Terrified of the slightest bump causing unseen and unstoppable bleeding, the tsarina prays constantly for his health and will do anything she can to keep him safe, including bringing in Rasputin to heal him when necessary. While she never directly says it, she wants the same thing from Masha, who knows she cannot provide the same reassurance, or healing powers, the tsarina is looking for. What Masha can do is tell stories. She spends her days with Alyosha telling him about her family, every detail of her father’s life, their home in Siberia, and her love of horses, and they discuss what they would do if they were to escape. Alyosha knows their lives will end but doesn’t speak of this to anyone but Masha, who fears he may be correct but doesn’t want to believe too strongly in his convictions. Their stories and time together become an escape, not only from the loneliness they both suffer from, but also from the daily reminders of what little life holds for them at the moment. If you know anything about the Romonovs, it’s a sad time for this once powerful family. The tsar no longer holds any power, and the tsarina has lost herself in her religion, spending her days praying for the safety of her son almost oblivious to the fact there is nothing left of their former life. The four Romanov daughters are not spoken of much but are mostly just background players filling out the tableau of characters. It’s all about Masha and Alyosha and the stories she’s telling him — her own form of healing therapy. While she doesn’t have the healing powers of her father, she can distract Alyosha and take him away from the horror that has become their lives. Each chapter in this book is a small story tied together by the people involved. You can’t really think of this book as traditional with a beginning, middle and end, but if you take each chapter as a story of its own, it’s an intriguing book. No, things won’t tie up nice and neat, but you will get the thread of a story as if someone were telling you about their time with a dear friend and what they spoke about and did during their time together. It’s also a very sweet love story of two teenagers who know they have no future together but spend each day trying to forget what they can’t change. They’re in an untenable situation, but they manage to seek out the only joy they can find. This book is aptly named. The story, while in no way linear, is a tale of love and hardship that spans years. Kathryn Harrison doesn’t ignore the ghost of death hanging over everyone, but manages to make the situation one of hope and a life dreamed of outside of palace walls. The famed mystic Rasputin — notorious for his otherworldly powers and his sexual escapades — may not have seemed like a traditional family man, but in fact, he had a wife and three children. His eldest daughter, Maria, is at the center of Kathryn Harrison’s new novel, Enchantments, a dark fairytale mash-up of history and magical realism set during the last days of Imperial Russia. That world is the glittering, doomed court of the last Romanov rulers, Nicholas and Alexandra, who took in Rasputin’s daughters after his murder in 1916. Alexandra’s treasured only son, Alexei — called Alyosha in the book— suffered terribly from hemophilia, which historians say only Rasputin was able to ease. Harrison says it was easy to imagine that the tsarina might have hoped Rasputin’s daughter would carry on her father’s healing powers after his death. And while Masha cannot heal the prince the way her father did, she does have some powers of her own. “She can’t cure him, but she can provide solace,” Harrison says, in the form of tales she spins about Russia, her father and the exploits of Handsome Alyosha, a mythical stand-in for the gravely ill prince who can have all the adventures the prince himself is denied. Harrison’s evocative seventh novel, Enchantments, engages the enduring fascination readers have with the end days of Russia’s Romanov Empire. Her own fascination with the downfall of tsarist Russia began early. “I was raised by maternal grandparents who were born in 1890 and 1899 respectively,” she said. “They were British subjects; George V was the cousin of the tsar. The Romanovs were very real in their household.” She recalls photographs of her grandmother dressed in the same style as the Romanov daughters. She toyed with the idea of writing a novel about the era, but couldn’t find the way until discovering, decades after she had first read Massie, that Rasputin’s older daughter Maria escaped the revolution. She became a lion tamer, was mauled by a bear in 1935 in Peru, Indiana, and nearly bled to death. At last she had her narrator, Maria, known in the novel as Masha. “It was irresistible subject matter,” Harrison said. Who better to write from the perspective of the daughter of Grigori Rasputin, the sexually voracious, predatory, charismatic religious figure who was the scandal of the court of Russia’s last tsar, than Harrison, whose 1997 memoir The Kiss describes the challenges of dealing as a young adult with a sexually voracious, predatory, charismatic “man of God,” her own father? Harrison kept the basic facts straight—Rasputin’s murder (December 1916), the date the tsar abdicated (in March 1917), the execution of the royal family (July 1918). And yes, Rasputin transported his two daughters from their native Siberia to St. Petersburg when they were teenagers so they could gain the education and polish. In Enchantments, Masha and her sister become wards of Tsar Nicholas after their father’s death and live with the royal family in Tsarskoe Selo, sixteen miles south of St. Petersburg. The tsar and tsarina hope Masha has inherited Rasputin’s healing abilities; she becomes their teenage son’s daily companion, making her an intimate witness to the last weeks of the doomed royal family’s lives before they are sent into exile in Siberia. Harrison’s narrative is structured primarily as a series of stories Masha tells Alyosha in his bedroom as he is recuperating from an accident. Masha finds herself fending off his roving hands. Harrison posits that she is concerned about his condition, and also that she not be seen as inheriting her father’s sexual appetites. Harrison’s version of the relationship between Rasputin and Masha is tender; he is a protective father, she a devoted daughter who prepares his body for burial and accepts his choice of a husband, a man she can’t bear, but who is able to get her out of Russia. 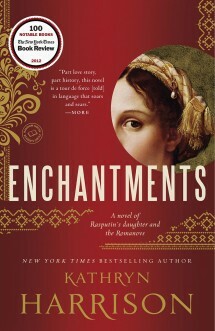 Enchantments is as much about storytelling as it is about the Romanovs and Rasputin’s daughter. She developed the interest by reading Robert K. Massey’s bestselling “Nicholas and Alexandra,” she explains in the acknowledgments with “Enchantments.” Massey’s work provides insight and details of the fall of the Romanovs and investigates the role played in that fall by the “mad monk” Grigory Rasputin. The unwashed, wild-eyed, yet highly charismatic priest was also a faith healer, able, possibly through hypnosis, to ease the pain and stop the bleeding in the hemophiliac Tsarevich Aloysha. Unfortunately for the Romanov family, Grigory Rasputin’s talent and reputation aroused suspicion in the court about the extent of his power over the country’s rulers. While most historians have centered their attention on Rasputin’s influence on the court and his scandalous behavior, Harrison discovers Rasputin actually had a wife and three legitimate children of his own. When she reads that one of his daughters immigrated to the United States to work as a lion tamer and was later mauled by a bear, Harrison said she knew this was her story to write. “Enchantments” is set in 1917 St. Petersburg, during the fall of the Romanov Empire. The novel starts immediately after Rasputin has been shot, beaten and finally successfully killed by holding his body down in the icy waters of the Neva River. Tsarina Alexandra, desperate to save her son and heir to the throne, brings Rasputin’s 18-year-old daughter, Masha, to live with the royal family in the Imperial Palace. Alexandra prays that Masha has inherited her father’s power to heal. Unfortunately, she did not. But when the tsar is forced to abdicate soon after Masha moves in and the Bolsheviks place the royal family under house arrest, Masha’s true talent is revealed. She is a master storyteller, and the fantasy world she weaves fascinates and distracts the teenage tsarevich, soothing if not healing him. As civil war rages around them, Aloysha and Masha grow closer as they share their stories of his parents’ love, her father’s wild exploits and the country they adore. “Enchantments” haunts with its beautiful writing and vivid characters who ache for a future the reader already knows is doomed. 1. Enchantments opens in 1917 St. Petersburg, with the body of “Mad Monk” Grigory Rasputin being pulled from the Neva River—a factually accurate event. But Harrison writes from the perspective of Rasputin’s daughter, Masha, weaving fact and fiction together throughout the novel. Discuss the ways in which Harrison plays with fact and fiction in Enchantments, and to what effect. 2. During one of their first meetings, Masha and Alyosha talk about how his mother worries endlessly about his health. Alyosha tells Masha that Tsarina Alexandra believes in “the grace of God” while he believes in history. (page 24) How does the tsarina’s faith in God influence her? How does Alyosha’s faith in history influence him? 3. Masha and Alyosha create a fantasy world while under house arrest at Tsarskoe Selo. Of all the stories they tell each other and the histories they share, what passages stand out to you? Why? 4. Masha and Varya have a complicated relationship in Enchantments. Varya tells little white lies to protect herself, while Masha believes in the power of truth. Masha tells Varya, “There are ways other than lying to protect oneself,” and Varya says, “I have no idea what you’re talking about. And neither do you.” (page 34) Discuss how truth and lies play into the novel. Does Masha have a point? Does Varya? 5. Harrison’s novel emphasizes the power of storytelling—through Rasputin and Masha’s relationship before his death, Masha and Alyosha’s interactions, and Alyosha’s later relations with Katya. Why do you think sharing stories—both real and imagined—hold so much power? 6. Masha struggles with Alyosha’s accident throughout the novel, wondering if he meant to hurt himself to distract his parents—and others at Tsarskoe Selo—from their plight. Alyosha tells Masha he didn’t mean to hurt himself, but she has trouble believing him. What do you think really happened? 7. As Masha and Alyosha tell their own versions of their family histories, they imagine how things might have turned out differently had their ancestors made different choices—if they had married other people, or made alternate political decisions, etc. How does the concept of fate unfold in the novel? What about the power of choice? 8. The devil and his entourage of demons, the Virgin, the Holy Spirit, a host of saints, and 630 Jesuses all appear in Enchantments. Discuss these religious apparitions and what they mean to and for the characters. 9. Alyosha and Masha are drawn to each other despite Alyosha’s condition, their age difference, and their unique predicament. Yet when they first kiss, Masha is so worried about hurting Alyosha that she can’t allow herself to enter the moment. Alyosha says, “It’s the only thing that does matter, whether or not you liked it.” Masha says, “There are other things to think about.” (page 155) What does Masha mean? How does her perspective affect their relationship? 10. According to the novel (and some historical reports), Rasputin’s death was widely predicted. Of her father and his unfortunate death, Masha reflects: “Once he’d met a man, he couldn’t imagine that man as a murderer, much less his murderer.” (page 201) Discuss this quote—in the context of both Rasputin’s death and more generally in the novel. 11. Masha and Alyosha’s relationship is cut short when she and her sister are abruptly set free from Tsarskoe Selo. Masha’s life takes many interesting turns after she leaves Alyosha: she gets married and is then widowed, moves from Paris to Vienna to America, joins the circus and is herself gravely injured. Discuss Masha’s life after the Romanovs. What did you find most surprising? Engaging? 12. Masha is afraid her father’s legacy will prevent her from getting her working papers in Paris, but in fact the Rasputin name helps her. She reflects: “The sole thing of value I possessed was my father’s history [and] his name.” (page 272) Is this true? If so, in what ways? 13. At the end of the novel, Masha dreams she is with the Romanov girls again. They are grown women, very much alive, and they want to show her a Faberge egg she has seen before. “But I know what’s inside,” Masha says. “I don’t need to see it again.” The girls all laugh and Tatiana says, “Of course you don’t know what’s inside! You can’t know. No one can. It’s never the same twice.” (pages 309–10) Discuss the meaning of this conversation in the context of the novel.